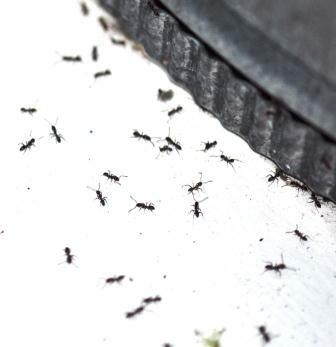 Many New Zealanders are already experiencing problems with ants in their homes and gardens. Usually ant numbers do not increase significantly until November but this year the numbers are well above normal and ants look set to invade more Kiwi homes and other buildings than before. Ant nests can be inside buildings but are more likely to be outside in dry soils under places like paving, drives and rocks. The ants move indoors seeking food. They are often found following each other in trails leading to and from food or marching across kitchen work tops and into larders. There are several pest species of ant in New Zealand and most are not native. They have been brought into the country accidentally from Australia and other places around the world. As with many other pests they have found conditions to their liking and multiply out of control because their natural predators or competition are not found in New Zealand. As a consequence, species such as Darwin Ants, Argentine Ants, White Footed Ants and others form much larger colonies in New Zealand than in their native regions. Since the beginning of August I have handled 125% more enquiries regarding ant problems than the same period last year. The combination of high soil moisture levels following a wet winter and early spring warmth have produced almost perfect conditions for ant problems. Spring is always the best time to start baiting to control ants. Baits have most effect when the nests have fewer numbers and queens are beginning production of eggs and new workers. With the early boom in ant problems it is particularly prudent to be pro-active and protect your home from ants now. Be prepared for the ant invasion, bait and protect yourself now. Baits and other products for control of ants are readily available at hardware stores and supermarkets and advice can be found at Kiwicare.co.nz or by contacting Kiwicare.